The Delhi Walla has never met the great Dayanita Singh although she lives in Delhi. Of course, I have come to know her over the years through her books. I also once sighted her in Khan Market but had no guts to approach her. I have been watching Mayank Austen Soofi for a while now and am very very impressed with the form he has made for himself, between literature and photography, between documentary and fiction. And while he works in the virtual world, he will receive a book dummy grant, so I can share with him the pleasure of building a physical book. 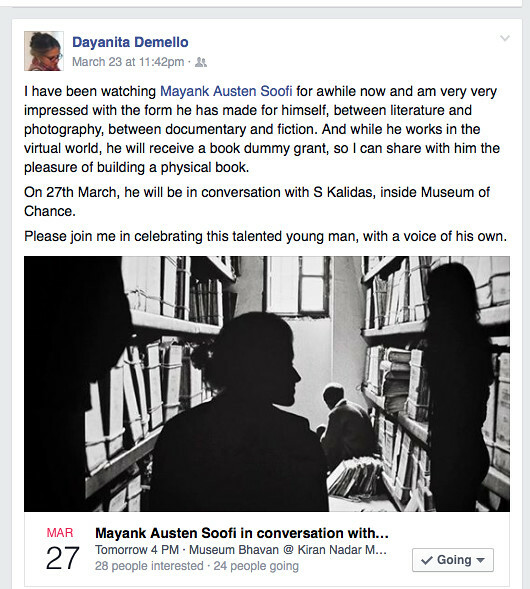 On 27th March, he will be in conversation with S Kalidas, inside Museum of Chance. Please join me in celebrating this talented young man, with a voice of his own. This is dream. It all becomes dreamier because India’s most important art and music critic will talk to me. I have been following S Kalidas’s writing since my childhood. This beautiful writer, who has hosted conversations with the likes of legends like painter MF Hussain, will now have a “conversation” with me. Is someone pulling a fast one on me? That sounds great! You deserve this, Mayank. All the very best for the conversation.